Traditional Office Space vs. Executive Office Suites – What’s the difference? Working from home can be wonderful for the right business model, but many work from home entrepreneurs and businesses are starting to realize that this set-up isn’t as beneficial in real-world application as it is in theory. One of the biggest challenges I hear about from prospective clients are related to distractions at home, in restaurants or coffee shops… loud noises, unreliable WiFi, household responsibilities, the kids playing in the other room.. The list goes on and on.. Distractions can easily wedge their way into your work day and can have a negative effect on daily productivity. Most likely, in the initial stage of your business this was not such a noticeable issue, but as you began to grow and your workload increased, you realize the importance of organization and structure in your work environment in order to be productive so you can meet your future business goals. Whether you own a small business, or are part of a larger group, you will be presented with two different options to work with. A traditional office space or an executive suite. So… what’s the real difference? A traditional office lease usually requires a longer-term commitment (generally 3 – 5 years) in exchange for a larger space and a lower price point per square foot. Common areas in traditional office settings generally consist of a shared lobby and community rest rooms. If you are looking for flexibility, long-term leases and contract add-ons may not be the best fit for your business. It is important to carefully consider exactly what your needs really are. If you have a larger business with multiple employees, this environment may be perfect for your business. But, if you are a small business owner, or only need one or two offices, you might want to consider the executive suites environment as an alternative. The executive suites’ office model generally offers smaller, furnished, individual offices that include a variety of amenities not included in the traditional office environment. These amenities can be anything from utilities, high speed Internet, common waiting areas, a shared receptionist, community break rooms, executive conference rooms, a workroom with a shared high-speed copier/scanner/printer, on-site shredding services, even complimentary beverages are available in most executive office settings. This type of work environment allows business owners to provide a professional image to their clients while leasing less individual office space with access to more common space, a receptionist and access to equipment/amenities at a lower monthly price point. And unlike traditional office spaces, executive suites can be leased for a shorter term (6-12 months) which reduces the stress that comes with committing to a multi-year contract. How can a shared workspace help your business? Business owners and entrepreneurs need structure. Ultimately businesses succeed when there is organization. This may be hard to achieve long term when working from a home office or public setting (i.e., coffee shops). Working around other small business owners and entrepreneurs helps build working relationships that benefit everyone. I have found that many of my tenants tend to work together when they need services we have available from fellow tenants at our location. These connections can open doors for new business relationships and opportunity as well as build a sense of community. One great benefit working in a shared office environment is the ability to work uninterrupted while having the flexibility to create your own work schedule. Having professional executive conference rooms to hold meetings, a quiet space to make conference calls (without background noise and interruptions), and a professional business address with low overhead can be a substantial reason to give shared work space a try. Finding a work space that is a good for your business doesn’t have to be an overwhelming process. Make sure you know what you are (or are not) paying for. Have a clear understanding of what’s included before you sign the lease. The right work environment can either contribute to your success or hinder it. Ultimately, working in a joint space can be an excellent experience for the right business. 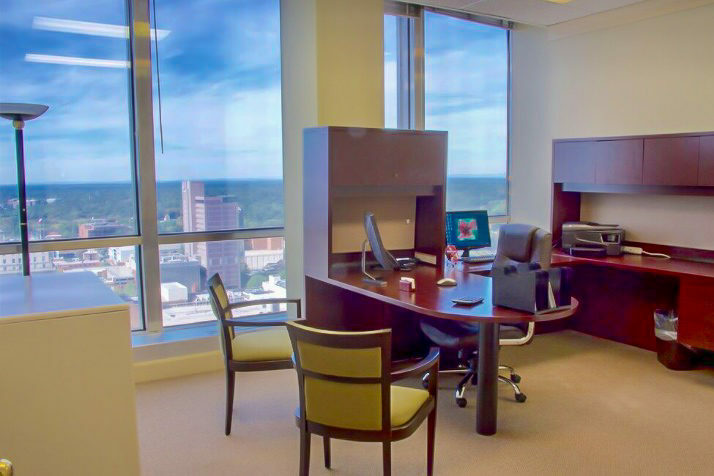 If you are interested in knowing more about how EBS Executive Suites can support your business, feel free to reach out to Sandy Meeks at 336-791-4743 or sandy@ebsexecutivesuitesllc.com to schedule a personal tour.